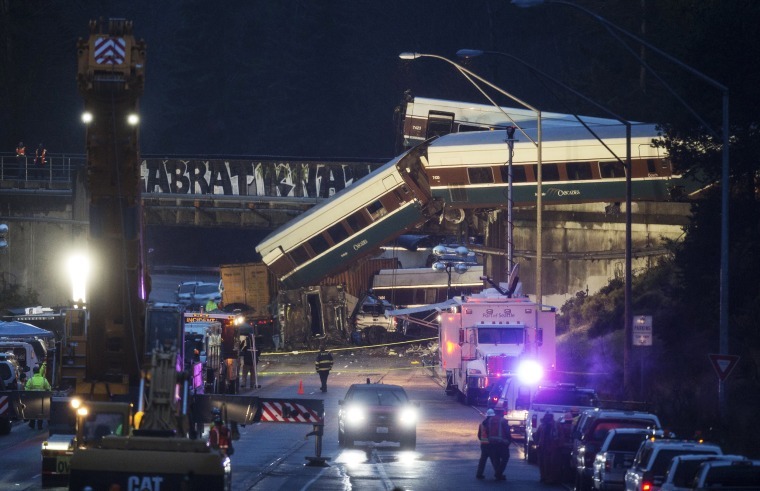 There will certainly be lawsuits against Amtrak following Monday's derailment, which killed three people and injured dozens more. The commuter train was traveling at 80 mph on a 30-mph stretch of track, according to investigators with the National Transportation Safety Board. Ordinarily, it’s difficult to forecast the total money damages for one person in any injury case. Each case requires complex calculations incorporating medical bills, future care, and valuations of past and future pain and loss of ability. In the case of a mass accident with multiple deaths and life-changing injuries, it’s even more difficult. In the case of a train derailment like this, however, the math has been simplified by statute. It’s worth no more than $295 million. Total. For everyone. The 1997 Amtrak Reform and Accountability Act originally set a $200 million maximum limit for the “allowable awards to all rail passengers, against all defendants, for all claims, including claims for punitive damages, arising from a single accident." That limit was later raised to $295 million in 2015. That means that no matter how many are killed, no matter how many are injured, and no matter how serious the injuries are, the maximum dollar amount all the plaintiffs combined can recover from all the defendants combined is $295 million. While that's a lot of money, it can be insufficient in the case of derailments, according to judges who call the process of taking from one victim and giving to another a “Sophie’s Choice” decision on a mass scale. The 2008 Metrolink crash near Chatsworth, California, left 24 dead and more than 100 injured. The judge tasked with allocating the $200 million among the victims estimated that the total value of the crash was potentially greater than $350 million, had each individual case gone to trial. Congress passes legislation like this in order to protect particular industries. Critics say these laws shield an industry from accountability, fail to realistically forecast damages and ignore the reality of inflation. There is historical evidence that judges, presidents and even Congress all agree with the law’s critics. In May 2015, Amtrak Train 188 derailed in Philadelphia after traveling in excess of 100 mph on a track area with a 50-mph speed limit. Eight passengers died and others were seriously injured. All their claims combined were subject to the $200 million damages cap. Later that year, President Barack Obama signed the Fixing America's Surface Transportation Act (“FAST Act”), which increased the maximum award to $295 million, and retroactively applied the limit to that derailment. The $295 million cap remains in place for Monday’s derailment. That is, unless Congress introduces another law to increase the maximum limit, to avoid the cap … set by Congress itself. CORRECTION (Dec. 20, 9:30 a.m.): An earlier version of this article misstated the liability cap for Amtrak. The ‘FAST Act’ increased the maximum award to $295 million for future accidents, not $200 million.